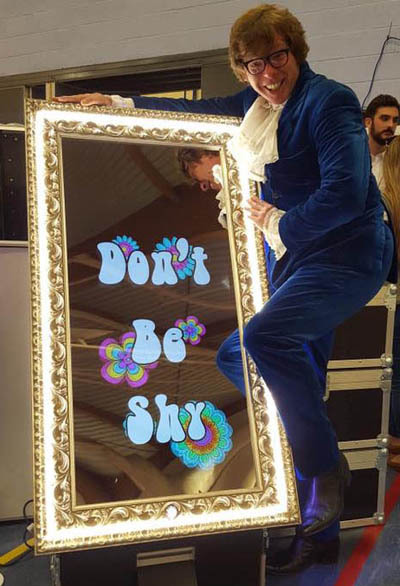 Here at Lichfield Inflatables and Entertainments we have great range of photo booths including sit-down type classic and green screen booths, open air selfie pods, and even magic mirrors that speak and interact with the users! 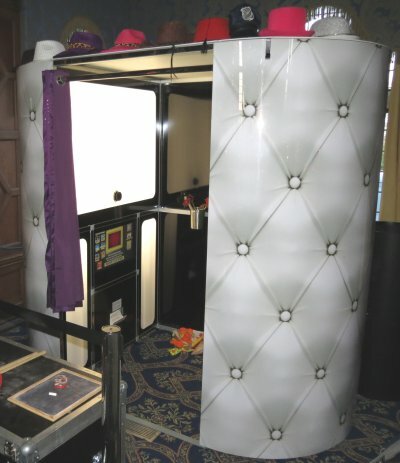 Photo Booths quickly became the must have item for your wedding reception, party, ball or prom night but selfie pods and magic mirrors are the new kids on the block and quickly gaining popularity. Whether you choose a booth, pod, or mirror it provides an fun way to capture the memories at your event for both you the event host and your guests. 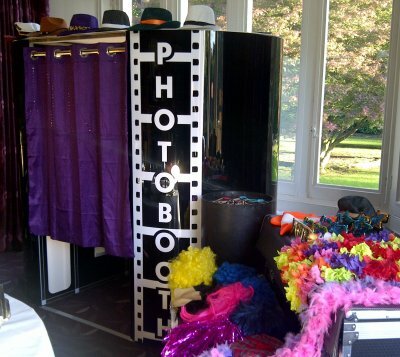 The photo booths, pods, and selfie mirrors all come with a friendly attendant to help your guests get the very results in their photos. They will also manage guestbooks for you, make sure the fun props are kept tidy, and change the booth media in the unlikely event it needs replacing. 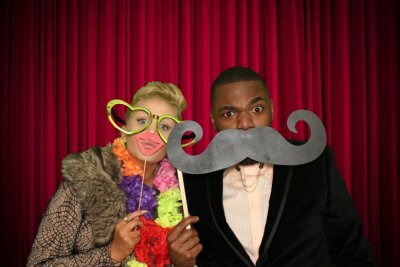 We have two different types of enclosed sit down photo booth available: the 'Fun' Photo Booth and the 'Green Screen' Photo Booth. 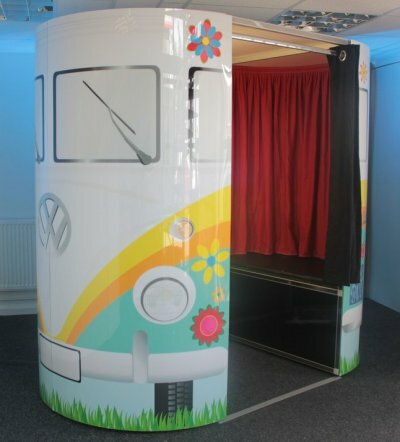 Choice of Gloss Black, White Chesterfield, VW Camper, or Vegas style photo booth. Traditional dark red cloth curtain background to the photos. Free option of including video message recording where your guests can record a personal video message to you. Each 'sitting'can choose between colour or black and white, or sepia photos via the touchscreen menu. Unlimited photo 'sittings' during the hire period with an instant 6x4in print containing the series of the four photos taken printed within seconds of the fourth photo. A USB stick containing digital copies of all the photos for the host of the event. This is produced and handed over at the end of the booking, you don't have to wait for it to be posted to you. Full touch screen control so each individual 'sitting' can choose colour or black and white photos as preferred. Choice of different green screen modes: Forced Green Screen where the backgrounds to the photos are set to 1-4 fixed images, Seven Theme where guests have the choice of seven set themes to the backgrounds, or the ultimate in greenscreen photo booths the 'Green Screen Dream Machine' that offers over 1000 different background and print combinations including 3D, magazine covers, and much more. Choice of Gloss Black, White Chesterfield, VW Camper, or Las Vegas style photo booth. Unlimited photo 'sittings' during the hire period. The new photo booth craze is the Magic Mirror. Users simply stand in front of the mirror, choose their props, strike a pose, and it takes photos through the mirror. While doing so the mirror will talk to, joke, and tease the users before it issues their print. There's a choice of three different mirror characters including an Austin Powers type mode. 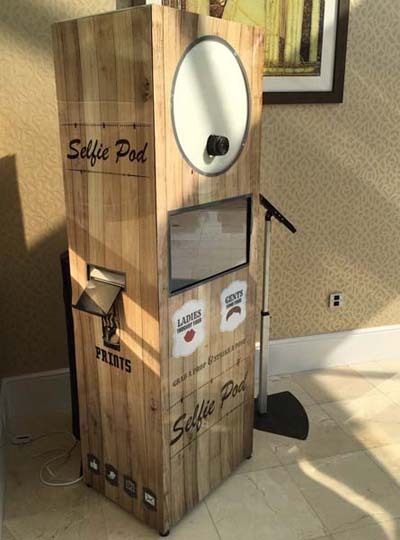 Like the Magic Mirror the Selfie Pod is an open air type booth and this is the cheapest type of booth we offer. It doesn't need as much operating space as a normal booth but if you have extra room it does have the benefit of being able to fit more people into the photos than an enclosed sit-down booth or mirror. 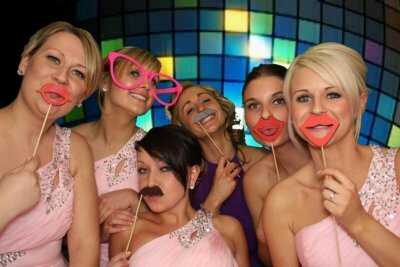 To obtain a quote for the hire of a photo booth, mirror, or selfie pod for your event please contact us and we'll be happy to help.